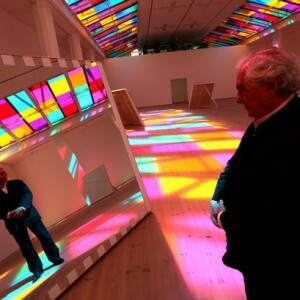 Buren not only takes pictures of his works as a tool to remind that the event happened, but also wanted to document himself in them as well to document the stage of life he is in. 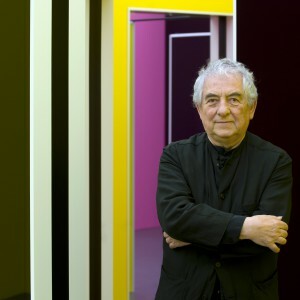 Buren did not believe that art needed to be in a gallery to be appreciated as art. 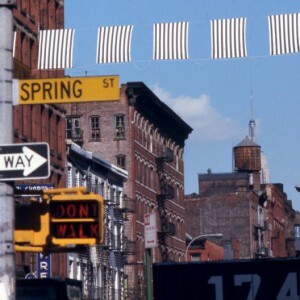 In light of this, he put his striped posters all over cities billboards and outside of various galleries illegally. 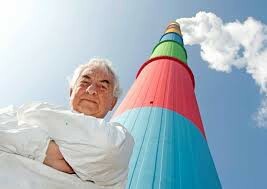 His rebelious nature and iconic stripes caused controversy all over the world. 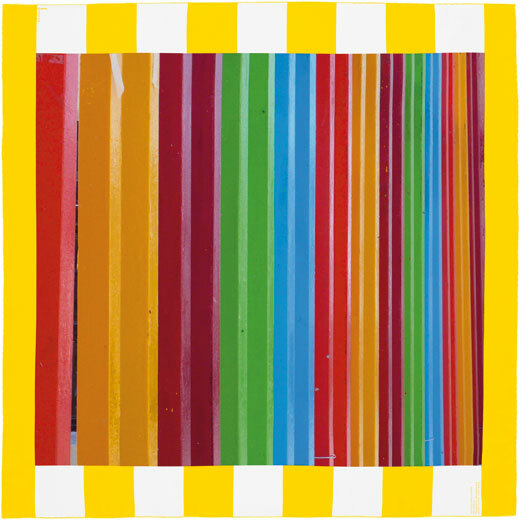 Buren was not invited to participate in exhibition “When attitudes become form” in Bern, Switzerland so he added his artwork all over the city covering billboards with his stripes. 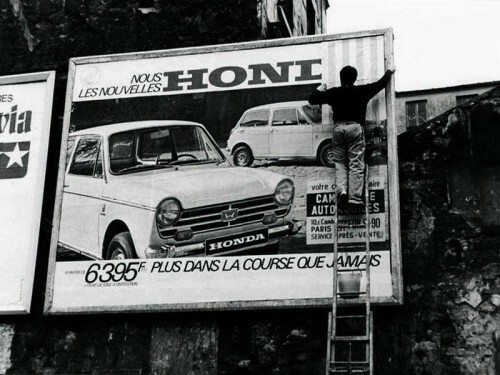 In 1969 he was arrested for covering billboards and asked to leave Switzerland. 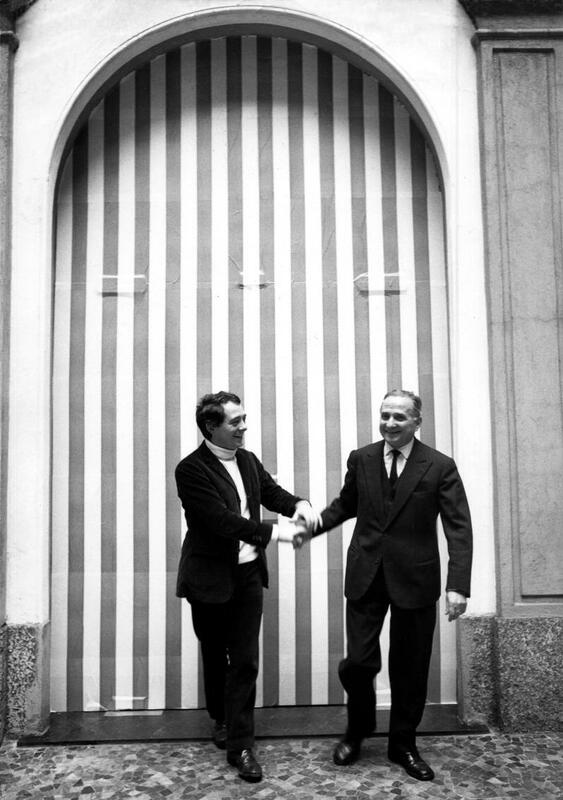 He blocked the entrance of the Apollinaire Gallery in Milan with his striped paper, closing down the gallery in 1968. As his first solo exhibition, Buren glued this green and white stripe paper on the doors of the gallery to open up questions of if the gallery is the only place that art can inhabit. 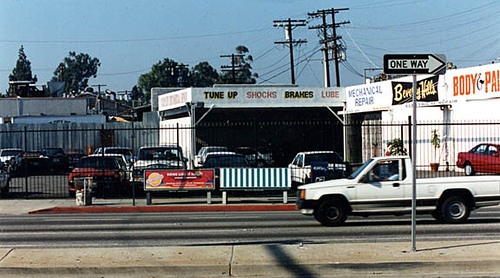 Buren pictured on the left. Hermes scarves made of silk have become one of the world’s most recognizable accessories. 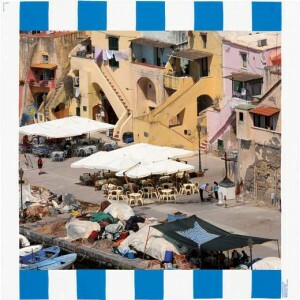 With a collarboration of Hermes and Buren, Buren had the idea of printing his “photo-souvenirs” onto scarves. Burens photo souvenirs are collections of his photographs of his own work and of his travels all over the world, with emphasis that photos are mere reminders of an event or environment and not a representation of it. 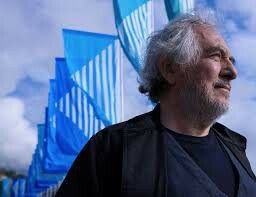 Twenty-two of his photos were selected including imagery of his own work, a flag-lined street, a fragment of architecture, geometric shapes, a fishing port, a sunset, flowers, and a Baroque dome. 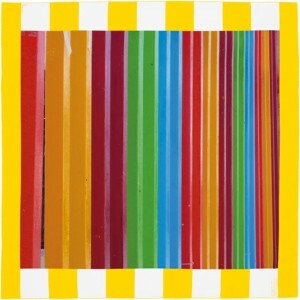 These photos are framed by Buren’s iconic 8.7cm wide alternating stripes of multiple colors. With the 22 photos and color options including sky blue, dark blue, yellow, black, orange, pink, red, green and purple for the stripes, 365 original and unique scarves were created. 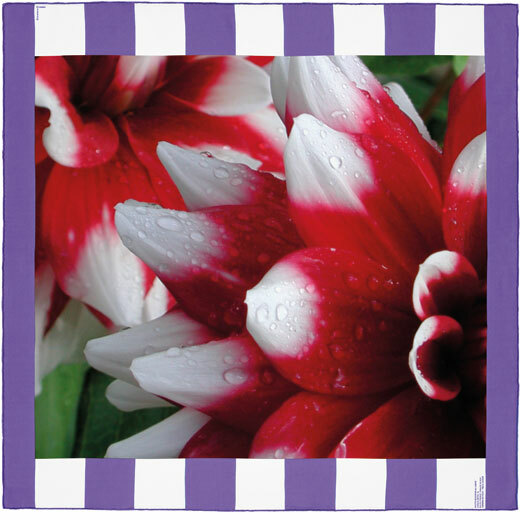 In order to transfer these images onto silk, they had to use ink-jet printing which allowed for more colors to be used than the original printing techniques. 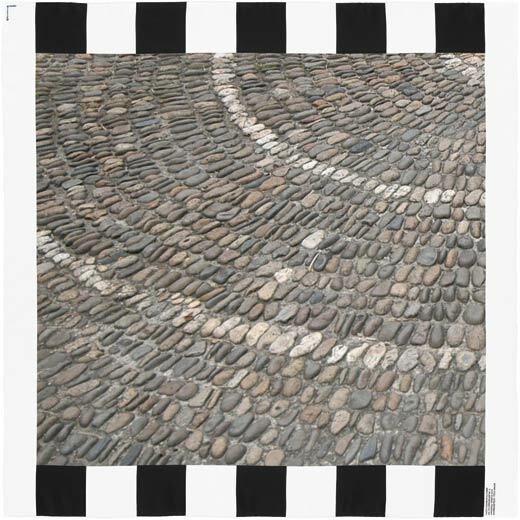 The stripes surrounding each photo-souvenir are a “visual tool” to create a connection by focusing into the image, but all creating a difference of context that make each scarf have its own contextual meaning. 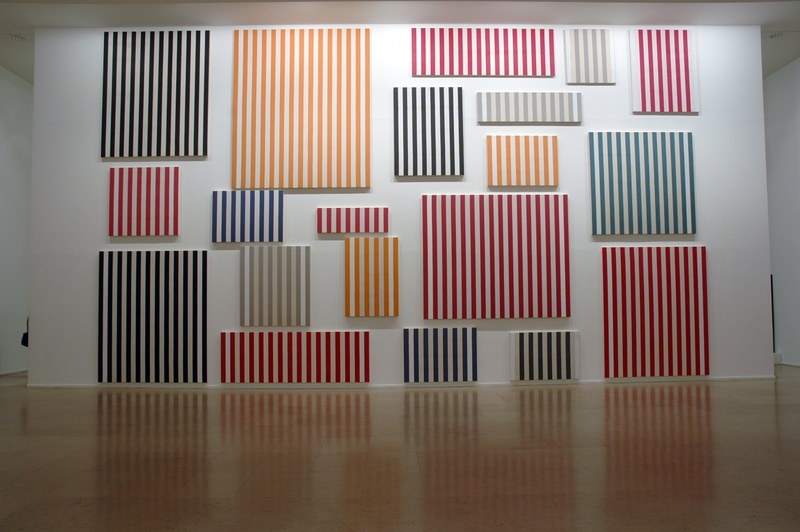 This framing technique is seen throughout Buren’s works, as his stripes can be used as a “view-finder” or “telescope” to direct the viewer into a specific perspective. The Spring/Summer 2013 Collection of Louis Vuitton (with Marc Jacobs as the creative head) at Paris Fashion Week was a collaboration with Daniel Buren. 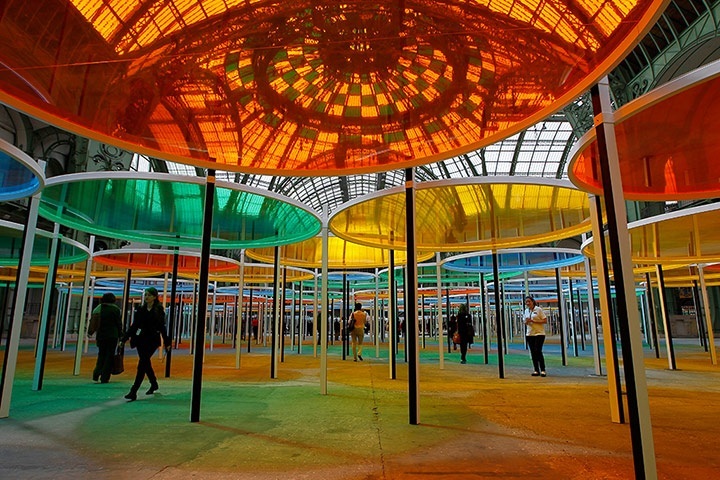 Marc Jacobs, a top name in the fashion industry was inspired by Buren and his Les Deux Plateux installation in Paris. 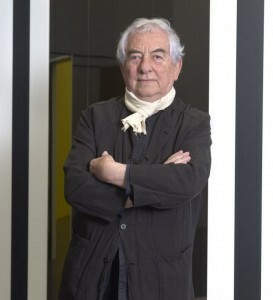 He sought out Buren to thank him for his work that inspired his Spring/Summer collection for Louis Vuitton, and after talking Buren became involved in the upcoming runway show at the Louvre for Paris Fashion Week. 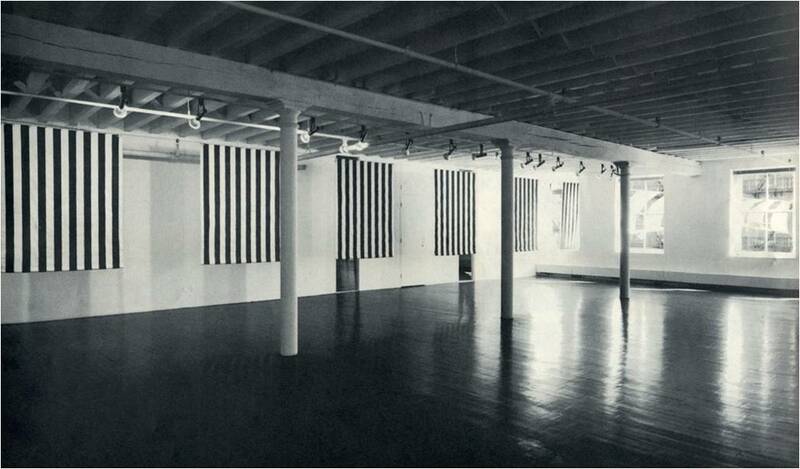 Buren received full creative freedom, and with the enabling of Jacobs treated the set of the runway show as a site-specific installation. 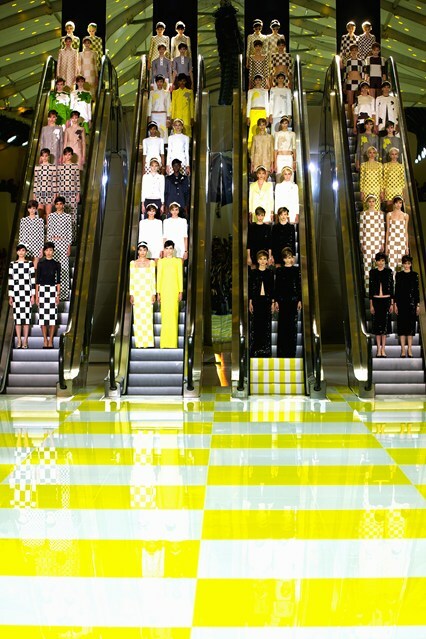 Four escalators were installed in the center courtyard of the Louvre, with white and yellow iconic Buren stripes on the stairs. 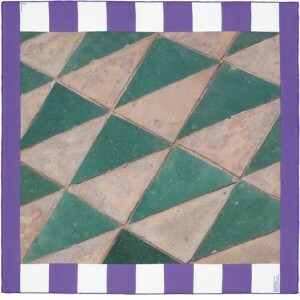 The floors alternated with white and yellow checkerboard designs, which reflects Louis Vuitton’s iconic checkered design as well as clear inspiration from Buren’s aesthetic. 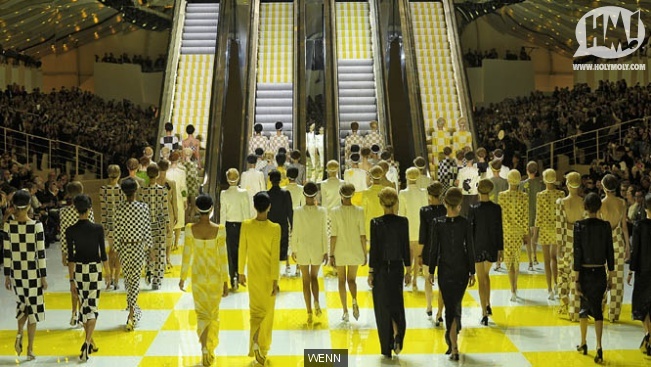 This flawlessly fit with Jacobs collection for Louis Vuitton, creating a clear juxtaposition of the set and the clothing. With such a successful collaboration, after the show Buren continued to work with Louis Vuitton and Jacobs and helped with the advertising campaign and storefronts for Louis Vuitton. These are all examples of Burens own photography of his own works. 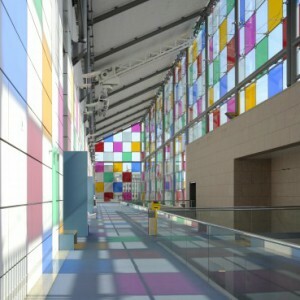 Buren’s site-specific works create an event contingent on the context and environment around it. This also created a non-permanancy of his works as when they could only exist in a specific site for so long. 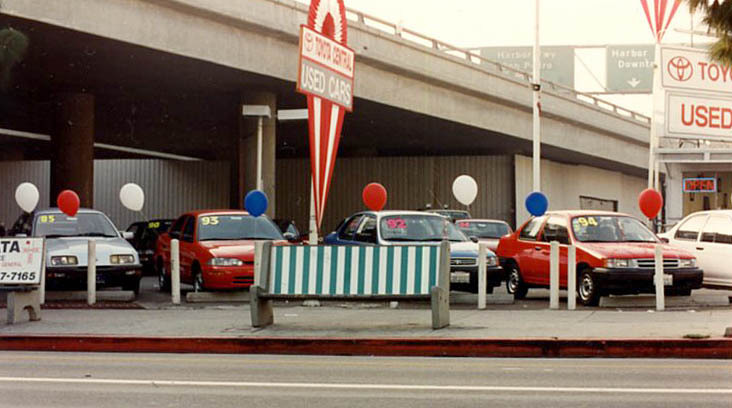 Buren documents his works through photography, calling each documentation a “photo-souvenir”. 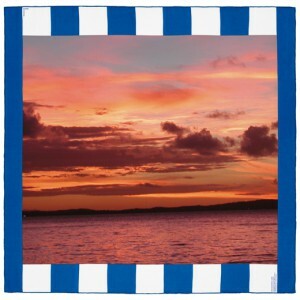 The photo is merely a souvenir because its a single perspective of an occurrence. His photos are approximations of the actual event that was left, leaving behind a a fragment of what was actually there. He claims these photos are not meant to be copies of what was, but rather tools used to remind. 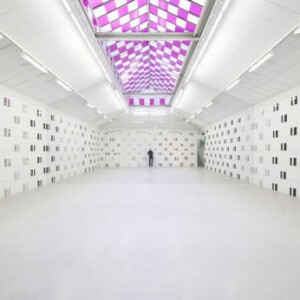 Cubes, cylinders, cubes, pyramids or arches are arranged symmetrically in the room ranging to over 6 meters high. 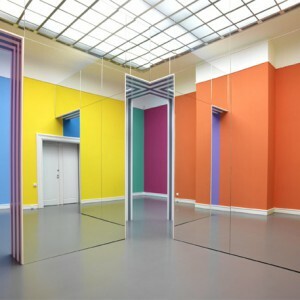 The room is divided into two parts, as the first half of the room is purely white, while the other half of the rooms shapes are coated in various vibrant colors. On the inside of the arches of the shape are Buren’s iconic black and white alternating 8.7 cm wide stripes. 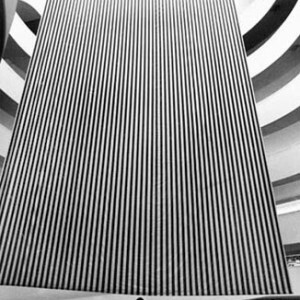 Each of these internally striped modules are lined up so that at the right angle and perspective they give the effect of a viewfinder or telescope. The outer facade of the museum was given a stained glass effect through the use tinted film and applied directly to the glass of the 25 meter high windows. 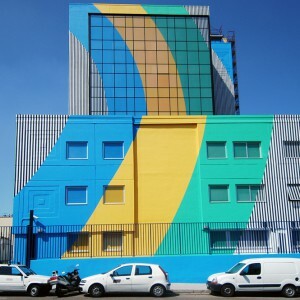 This altered the appearance and perspective of the museums presence on the outside and the inside. As the lighting and weather changed, each tinted film would cast reflections through the glass that would change the color of the walls, ceiling an floors of the museum creating a temporary new and radiant environment. 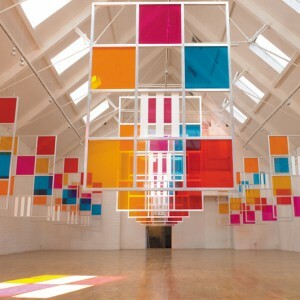 Another site specific installation, as Buren designed for the specific dimensions of the space. 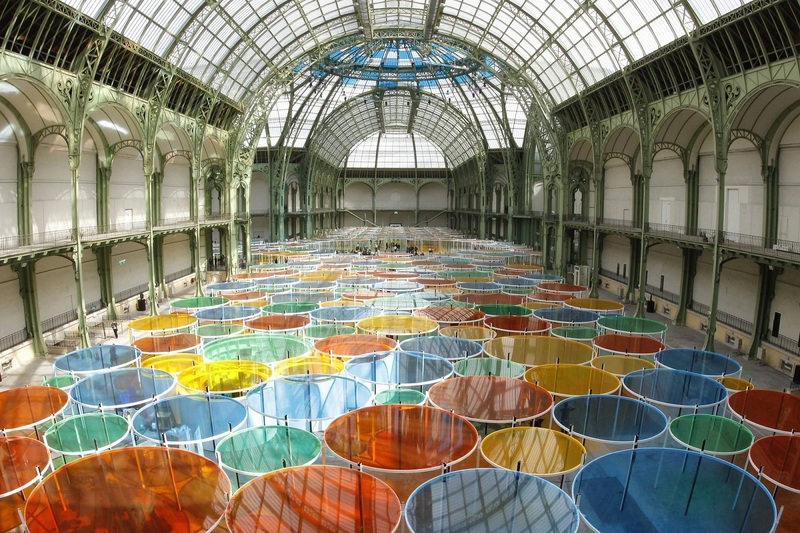 It consists of a canopy of floating horizontal circles of various sizes and heights each touching the next. The frame of each circle is covered blue, yellow, orange or green translucent plastic film. 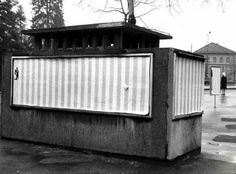 They are supported by vertical posts with alternating sides of white and black, creating the illusion of stripes. 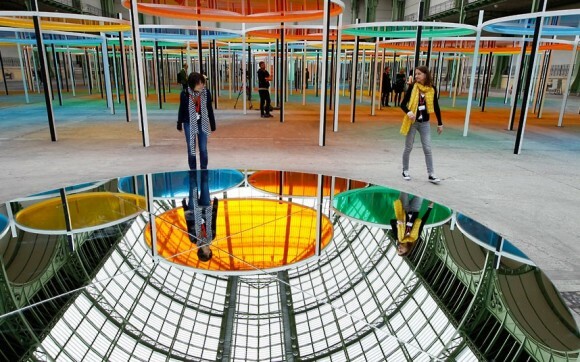 Around the installation there are circle mirrors on the ground, which provide a change in context and perspective of the same environment that viewers have already witnesses. 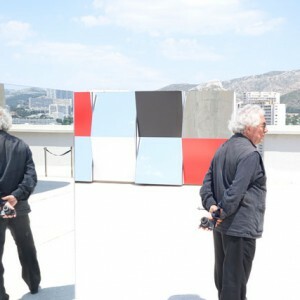 The colored film and poles created light, color and shadow that took over the viewers environment, and depending on ones perspective and use of the mirror there is a change in context of what this work represents to different individuals. 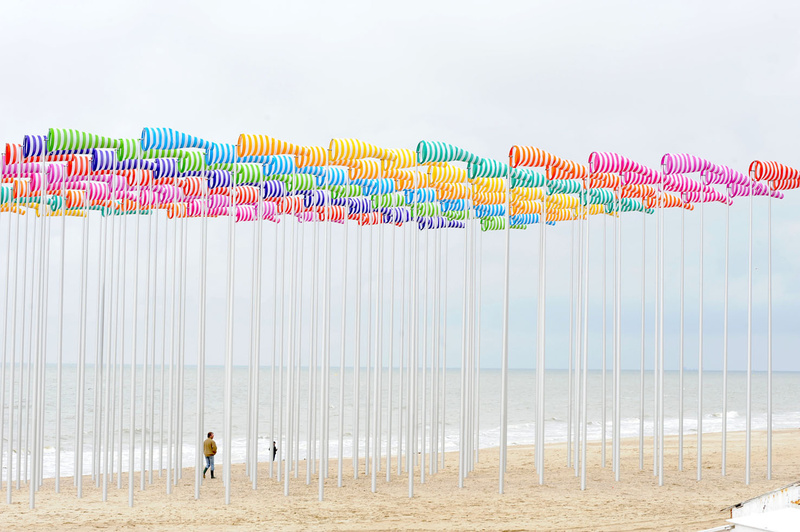 Meaning “The wind blows where it pleases”, Buren used 100 flagpoles with 100 windsocks on the beach of De Haan, Belgium to create the illusion of a forest. 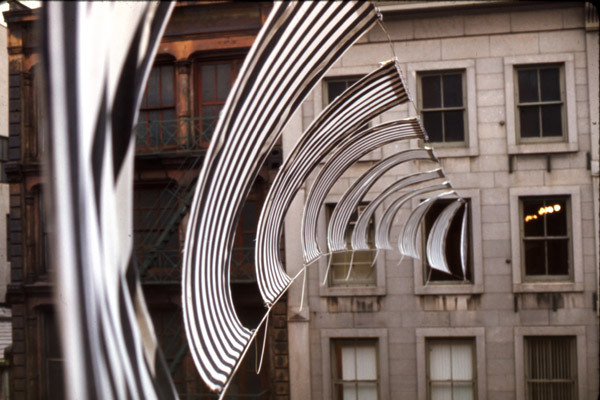 Continuing his site-specific works to create a context that helps define the work, this installation like others was meant to be interacted with. One would play around with walking about these poles to see the relationship between an object and its context to create multiple viewpoints and perspectives. 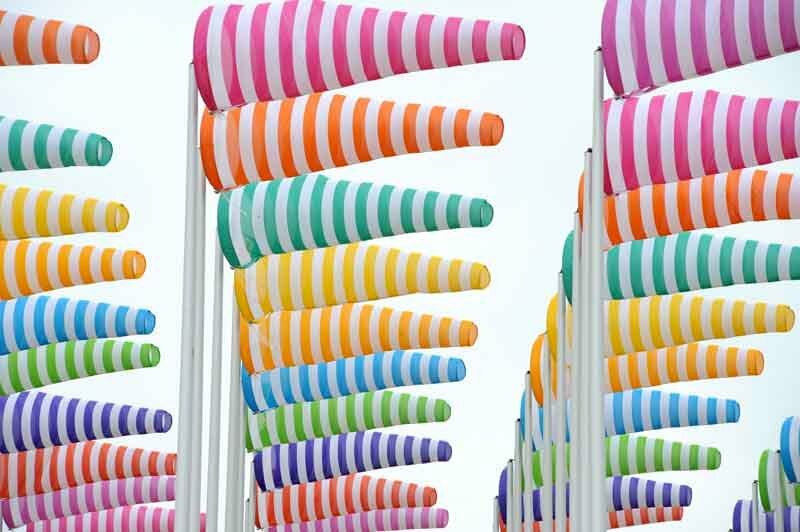 In this installation, the work itself which took charge of the winds movement and imposed it on the viewer as the windsocks raised, lowered, and shifted left to right. 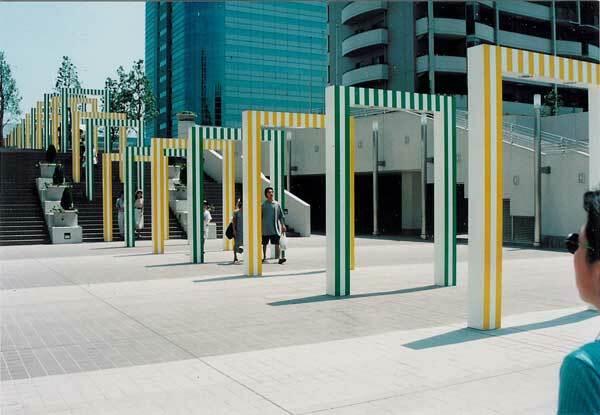 Buren’s installations were site specific, which also means they were usually not permanent. 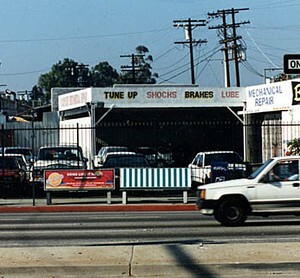 Like this one, he did many short term art installations lasting only a few months and then taken down. 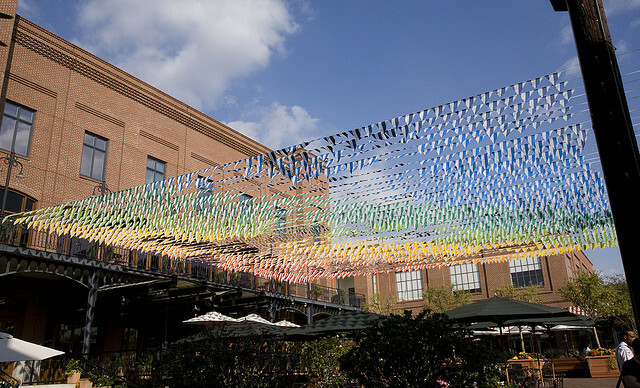 This canopy consists of 2,268 colorful striped flags suspended over a square. 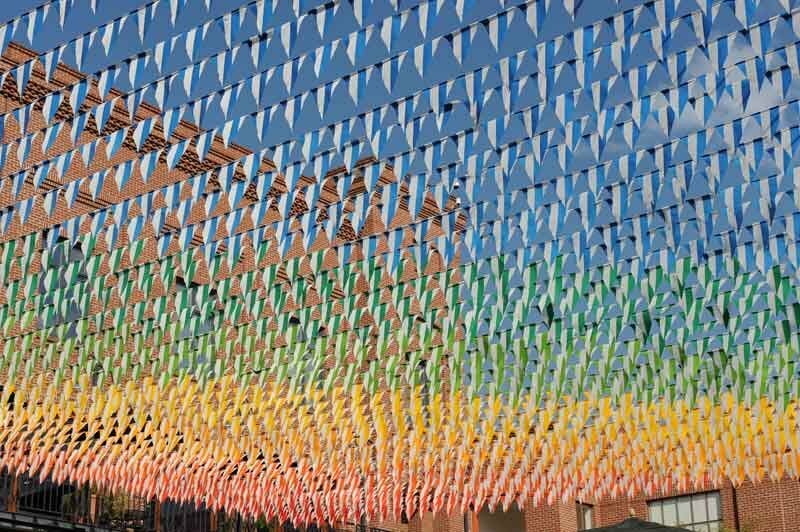 The flags create an open ceiling over visitor’s heads with a rainbow of 10 colors striped vertically with white. As the flags flutter in the breeze as they cast shadows and designs onto the square below. 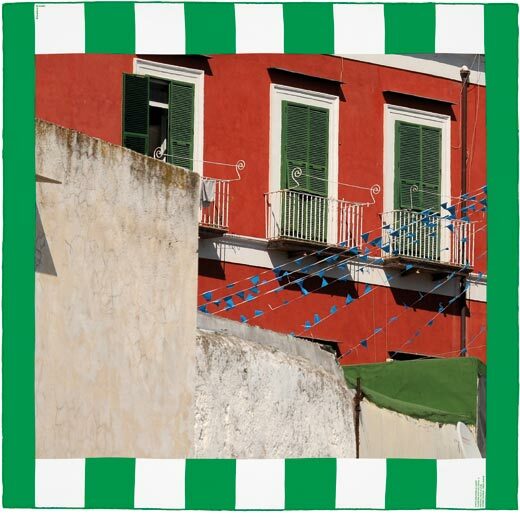 Depending on weather and the viewers perspective, these flags will represent something different based on the context at which they are seen in. This was a public commission that overlooked Tokyo Bay on the artificial island of Odaiba. Situated on a walkway between apartment blocks, it is composed of twenty-five striped porticoes installed at regular intervals. They are staggered at various heights as they progress one after another. 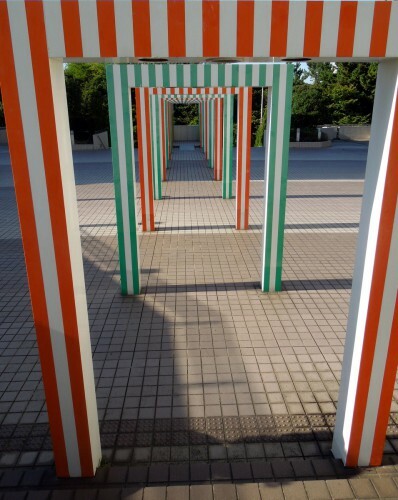 At each end, the porticoes are book-ended by mirrored walls.They are painted alternating between yellow/green striped with white as you climb uphill and orange/green striped with white when walking downhill. The inner and outer edges are white with lights below the crossbeams. The forms create an open walkway of arches without walls that invites pedestrians to walk through them. They’re also like window frames or viewfinders asking to be looked through, to position viewers within their environment and dictate the context they are seeing through. 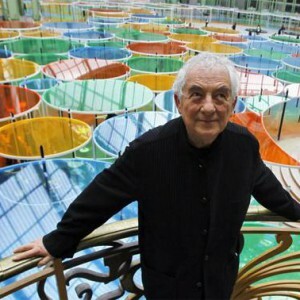 This was Buren’s first permanent public project. 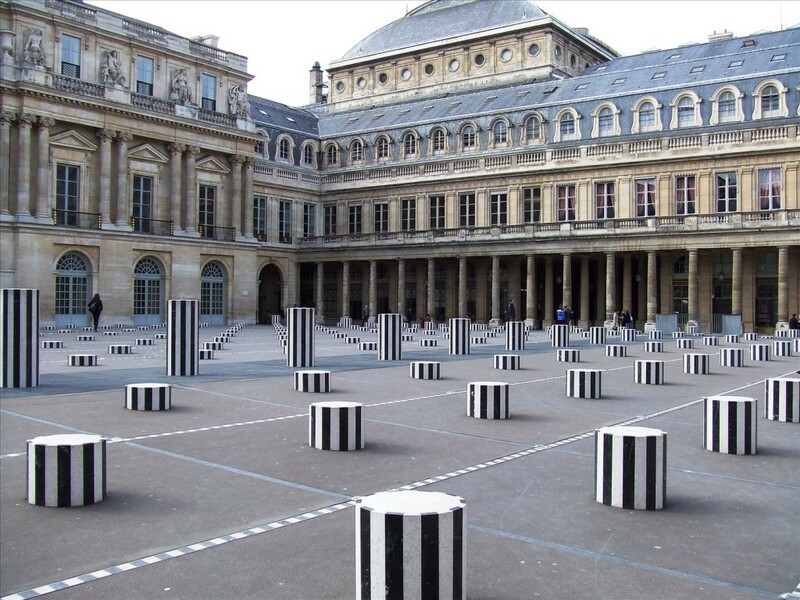 With a total of 252 striped columns, made from marble and concrete, these took up the entire inner courtyard of the Palais Royal in Paris. There was also red and green lights and swirling water feature running under a metal grill. The columns are evenly spaced, but sometimes vary in height. 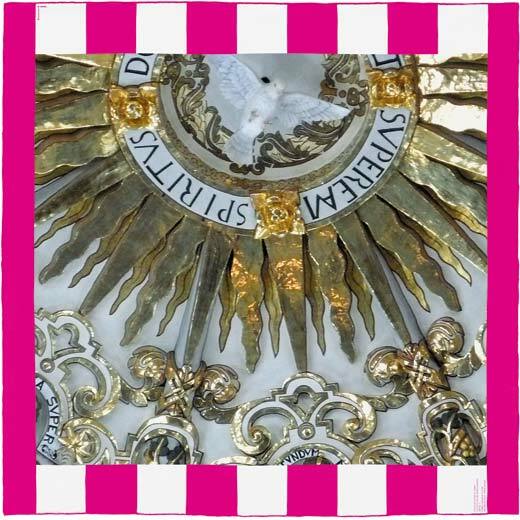 This piece is a highly controversial, as eight days before the installation was due to for completion, angry residents of the Palais Royal halted construction. The construction eventually continued, and two months after work continued, they “decided to tolerate rather than tear down”. The base of the columns go down into the basement of the courtyard and rise up to the ground level. This is to show the uniting of the past, present and future by symbolizing the historical relationship between underground and street level Paris. 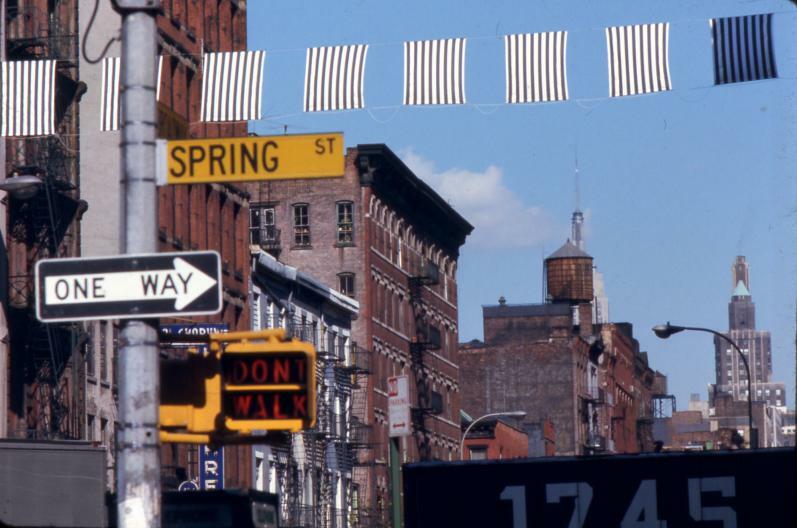 Nineteen banners painted on both sides with Buren’s identifying stripes were hung inside and outside of the John Weber Gallery. Nine pieces were hung inside the gallery with a middle banner connecting the remaining nine banners hanging outside of the gallery across West Broadway Street in New York. 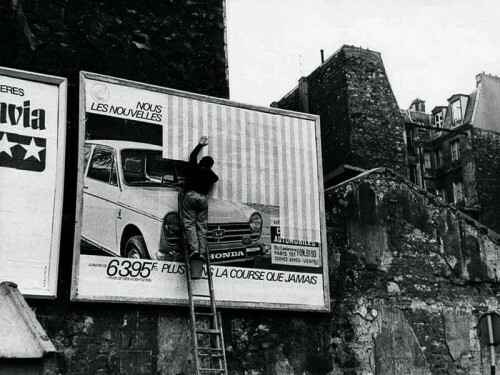 The identical banners were framed in two contexts, shows the idea of the surrounding providing different frames to the same objects. They were shown in the cultural context of an art gallery and the urban frame of New York city. 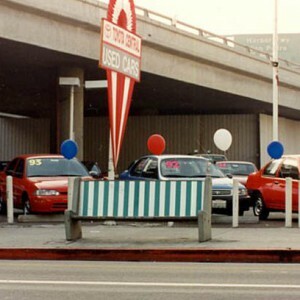 Although all the same banner, the context in which they are placed gives them a different meaning, which is an idea that Buren has explored his whole career with his site-specific works. 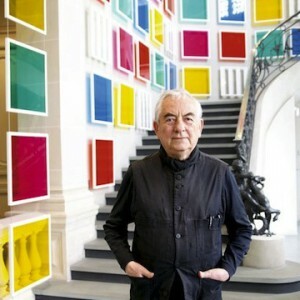 Daniel Buren gave clear specifications for the arrangement of these canvases. There were two options, either they would be exhibited on two walls facing each other, or specifically ordered on a single wall. The arrangement of the canvases is intentional and autonomous, as they are not meant to be separated. 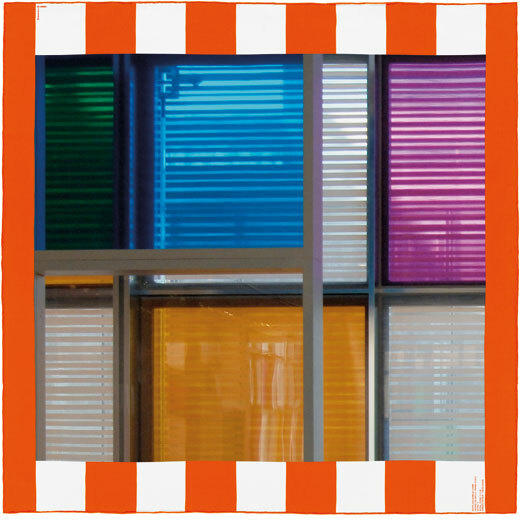 The correlation of colors and arrangement of frames causes a conflict, which is to intentionally avoid any impression of structure. 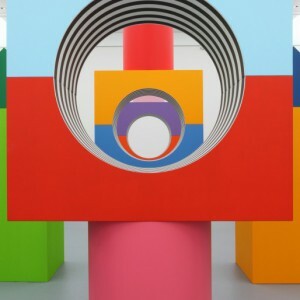 This shows Buren’s attempt to challenge the traditional gallery, and make an image that creates conflict within its own parts but also the works around it. The project was made site specific for this exact place in the Guggenheim museum. 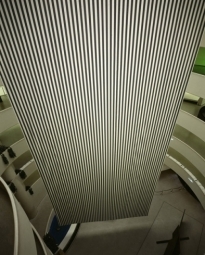 He created a 66 x 32 ft. canvas to divide the Guggenheim’s rotunda in New York. This was the piece that was protested and removed after one day because it obstructed the view to surrounding works. 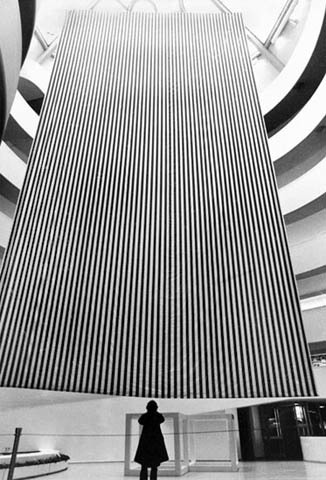 As the viewers went up the circular ramps, at times they would see a flat expanse of canvas, similar to a large painting. 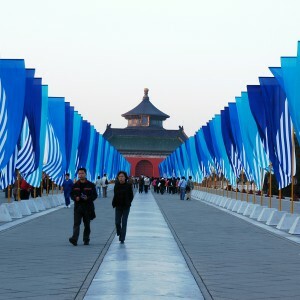 But as they continued around, the banner could also be experienced as a sculptural object. It specifically addressed the museum’s imposing architecture and transformed the way it functioned. 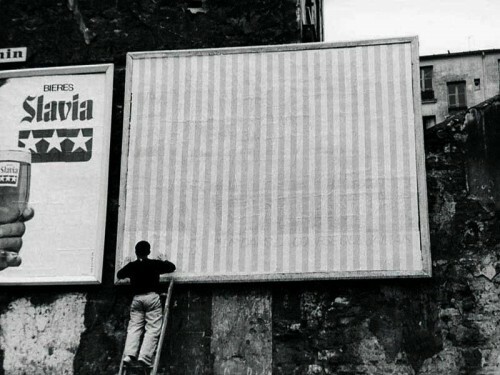 Buren put up alternating stripes of paper over billboards and advertisements around Paris. He was doing his own form of detournement, which meant taking something that has a common use or meaning and reusing it for a different manner without public approval. 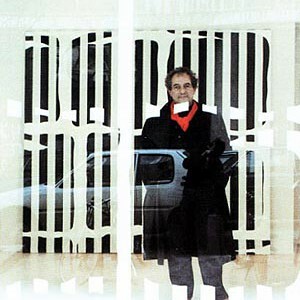 His take on detournement was producing public art work by hanging these hundreds of stripped posters over advertisements and in metro stations, showing his refusal of the status quo. It also showed his motive that art does not need a gallery or museum to exist, and that its existence can be boundlessness. 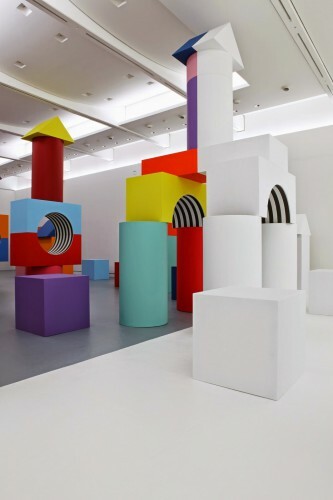 For Buren the city was a limitless exhibition without rules. Art can then freely exist as an uncommodified and unreciprocated event that exists anywhere.